The Democratic Party in Aberdeen always maintains two political organizations – a Continuing Political Committee (CPC) and a Joint Candidates Committee. The first is perennially in business while the second only exists for a specific election and is then terminated. In Aberdeen, the Democratic CPC is the Aberdeen Democratic Executive Committee. Each year, they raise money, primarily from outside contributors seeking Pay-to-Play, and then use or distribute that money for political activities. And each election cycle, some of that money is misspent or disappears. According to filings with the New Jersey Election Law Enforcement Commission (ELEC), the Aberdeen Democratic Executive Committee made three contributions to Mayor Sobel’s Aberdeen Dem Campaign 2005 - $10,000 on 10/23, $10,000 on 10/25, and $3,000 on 11/7 (see attached). That last donation was never recorded by Sobel’s campaign(see attached). This wasn’t an oversight in reporting – the campaign never deposited the money. The filings show a net deposit, following total receipts and expenditures, of $189.55, which was promptly withdrawn when the bank account was closed. If the campaign did receive that money, there’s no mention of any expenditures to account for it. Yet, the executive committee did withdraw that money because otherwise their financial records wouldn’t match their filings. Where did the money go? Can’t say. But it wasn’t a one-time occurrence. In 2007, filings show the executive committee made several donations to the Aberdeen Dem Campaign 2007, including a $1,000 donation made by wire on 11/28 (see attached). Once again, there’s no record of the Dem Campaign having received it by their last filing on 12/3 (see attached). In fact, on 12/3 they re-filed the same numbers from 10/31 (see attached). Meanwhile, these same filings show the Executive Committee paying Councilman Vinci $3,510 for expenses and consulting fees during the 2006-2007 period (see attached). In other words, Councilman Vinci was paid consulting fees by the local Democratic Party during his own re-election campaign. In fact, he was the committee’s single largest expense aside from direct contributions to the campaign itself. As for the individual responsible for the Executive Committee’s finances, there’s only one name that is consistently on all filings as being authorized to sign checks and execute bank transactions – Judith Kauff, a.k.a. the wife of Norman Kauff (see attached). Do I hear bells? >>> Read more! On October 10th, 2007, the New Jersey Election Law Enforcement Commission released its Pay-to-Play online database. The state defines Pay-to-Play as “[c]ontributions by for-profit business entities that have or are seeking New Jersey government contracts.” Of the 1775 political contributors who filed, Aberdeen Township’s engineer, CME Associates, is #3 on the list. Government contracts are normally awarded to the lowest qualified bid. The major exception is in the area of professional services, which are deemed too complex to simply award to the lowest bidder (you don’t pick doctors and lawyers based upon who’s cheapest). Aberdeen adheres to the “Fair and Open” process which allows anyone, no matter how much money they’ve given to the officeholders, to bid for business, as long as the process is open to public review. In 2006, the only year available in the online database, the three largest participants in Pay-to-Play were engineering firms. CME Associates was the third largest – they contributed $404,899 and won $19.9 million in government contracts. Law firms were the second largest group to engage in Pay-to-Play. Kudos to Norman Kauff whose firm, DeCotiis, FitzPatrick, Cole & Wisler, was number one in government contracts ($12 million) but only third in political contributions ($190,486). It’s no surprise that municipalities that hire Kauff also prefer to do business with CME Associates. Despite the large figures, these numbers grossly underestimate the true level of contributions and government contracts. For example, they don’t count the $50,000 CME Associates donated to the Democratic Legislative Leadership Committee in 2006. Nor do they include the hundreds of thousands of dollars CME Associates collects in “fees” directly from the local residents and businesses in Aberdeen Township each year. Over the past decade, CME Associates has donated more than $60,000 to the Aberdeen Democratic Executive Committee, not including any monies that may have been “wheeled” through the Monmouth County Democratic Party or given “off the books”. During that same period, CME Associates has been paid back two hundred-fold. I recently received a copy of all vendor payments to CME Associates from January 7th, 2005, to March 18th, 2008. During that time, the township made 2,597 payments to CME Associates, totaling $3,692,445.72. Much of that money comes directly from the township, such as the $229,595 paid on January 12th, 2008, for road improvements, but most payments come from the locals. The game works as follows – the township continually expands the range of permits that require review by an engineer. The homeowner/business owner is then required to place funds in escrow to cover any future expenses. CME Associates will drain the escrow account of all funds before they certify the property. The system becomes a scam as residents and local businesses are forced to pay for unwarranted services to a company that is the governing body’s single largest contributor. If unnecessary and inflated payments to CME Associates were added to the tax levy, Aberdeen Township would have the highest tax rate in Monmouth County, compared to the number three position it now holds. For less than $8,000 a year in political contributions, CME Associates gets to take over a million dollars a year from the township. Looks like Mayor Sobel has pimped out the township for “professional services” in a no-bid contract. >>> Read more! The four H’s stand for Head, Heart, Hands, and Health. Its mission is to engage youth to their fullest potential. And the 4-H wouldn’t exist in Matawan and Aberdeen without Kris Bradley. Originally conceived as an outlet for a son who suffers from autism, Kris has built the local 4-H club into one of the most active volunteer groups in Matawan-Aberdeen. Although the group’s primary focus is to support the environment (they recently persuaded Matawan to participate in Earth Hour), they’ve committed themselves to beautifying the community through local rehabilitation projects. Their current venture is the Jackson Park rejuvenation. The Matawan Aberdeen 4-H will create a community garden with flower beds, flowering bushes, and an overall makeover. Other parks and the seawall are next on the list. Kris has also been successfully garnering local support. Mary Mullaney, wife of Matawan Councilman Bud Mullaney, is one of the club’s most active supporters. Former Superintendent Bruce Quinn provided space at the Cliffwood Elementary School for the group’s bi-monthly meeting. Local businesses, such as Starbucks, have been contributing towards the club’s fundraising goal of $3,000. , and is a tax-exempt charitable organization. The Jackson Park rejuvenation is scheduled for April 19th. Starbucks has agreed to sponsor each volunteer who shows up to work at the rate of $10 per hour. All financial assistance is through private donations. Kris and crew at the 4-H deserve our support. After all, everything they do is for our benefit. >>> Read more! Last year, sensing they may finally lose power after a dozen years of control, the Aberdeen Democratic Executive Committee devised a simple yet effective strategy. I call it the “Spend, Don’t Tax” plan. First, they forced the school district to cut its proposed tax increase from 5% to 2.3% but allowed the district to retain all of the proposed spending increases. The township then used all its financial wizardry to postpone any tax increases until the following year. The gambit succeeded but barely. All four democratic candidates were elected but not one of them by a majority vote. And the taxpayers? 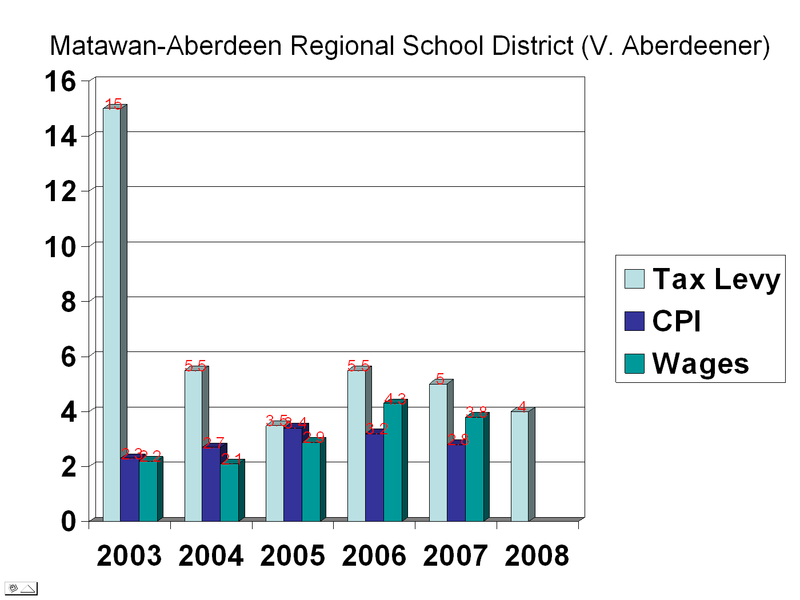 We’re now getting hit simultaneously with the largest municipal tax levy increase and the largest asset depletion in Aberdeen’s 150-year history – An $871,487 tax increase (Sheet 3B) and a $1,259,316 loss of assets (Sheet 39), including a $600,000 withdrawal from the General Capital Fund (Sheet 10A). The municipal tax levy is jumping 12% to $7.8 million in a $15.3 million overall budget. This translates into a 9.9 cent property tax increase for every $100 of assessed real property, or about $140 for the average homeowner on top of every other tax increase and a nearly 17% reduction in municipal assets. This fiscal catastrophe was not caused by the state’s withdrawal of municipal aid. Following Aberdeen’s $210,000 loss in municipal aid, Mayor Sobel cut $179,000 from the budget. He insisted that taxes not go higher than 9.9 cents for the same reason that stores prefer to charge 99 cents rather than raise prices to the next dollar. The budget was reviewed and certified as “CAP compliant” by the town’s “independent” auditor, Tom Fallon, whose office is located at Airport Plaza, the strip mall owned by Vic Scudiery, Chairman of the Monmouth County Democratic Party. His father is Charles Fallon, the former Treasurer of the Monmouth County Democratic Party who pleaded guilty to bribing then Hudson County Executive Janiszewski in exchange for government contracts. Fallon's family has also contributed thousands of dollars to the local Democratic party. Since this year’s budget derives from last year’s fiscal bait and switch, let’s look at some of the increases over the past two years. Since 2006, pension payments have increased 147% for the Police & Fireman’s fund and 155% for the Public Employees' fund (Sheet 20). During the same period, Library maintenance has risen 22% (Sheet 20). While the grant portion of the Safe & Secure Communities Program declined by 10%, the township’s matching portion rose to $201,457 from last year's $15,000 (Sheet 24A). Debt service payments have increased 15% percent since 2006 and now account for 11% of the total budget (Sheet 27). Deferred charges have exploded from $21,600 in 2006 to $248,600 today. Meanwhile, those developers who are enrolled in the PILOT (payment in lieu of taxes) program have been spared the council's wrath (Sheet 10). I’m sure our elected representatives will be telling us how they exercise fiscal restraint but the truth is that taxes and corruption are choking the lifeblood from our community. I look forward to next year’s election when Mayor Sobel and his cohorts will be the ones left twisting in the wind. >>> Read more! Mother and baby boy are doing great. Your mother, father, and big brother Jack love you very much. Special thanks to the staff at Riverview Medical Center for their excellent care and generous hospitality. >>> Read more! This past week, at a special action meeting to review the “tentative” 2008-2009 school budget, our Matawan-Aberdeen School Board of Education hosted a Theater of the Absurd. After primping themselves for Huskievision, the district-financed television station, and sipping from bottled water, they publicly bemoaned that the state had cruelly limited their ability to tax and pillage the locals. Even worse, the state had allocated money for tax relief, money that could have spent by the schools. Oh, the humanity! The board then engaged in a bit of Orwellian doublespeak should anyone try to quote them. Barbato asked if the board could “technically” do anything to grab the tax relief money for themselves. Donaghue asked if they could get a “waiver” to raise taxes even higher. Again and again, they thanked the administration for presenting a school budget that raises taxes and spending to the absolute legal limit. In fact, Dr. O’Malley presented the budget in this fashion – The law forbids us from raising the tax levy any higher than $44,326,599 so that’s the number we’ll be using. The overall proposed budget is $63,356,016. Then the conversation turned to how they could market their tax and spend scheme. According to Aitken, any rejection of the bloated school budget would put our children “at risk”. The school board ultimately borrowed bankrupt Foxton’s slogan – “2%”. Even though the board is raising taxes by the legal maximum of 4%, the net rise is only 2% if you include the state-sponsored tax relief money they’ll also be taking. By mindlessly repeating the “2%” mantra, they hope the voters will forget that the confiscated tax-relief funds were ever meant for the taxpayer’s benefit. To make this Orwellian production complete, Zavorskas assumed the role of thought police. She asked if the PowerPoint slide showing prior budget increases could be “clarified” for the 2003-2004 school year when the budget rose an eye-popping 15%, the same year Zavorskas was school board president. As much as I enjoy theater, it’s time to give these charlatans the hook. Here are the simple facts and you can judge for yourself. Putting aside certain exclusions, the state has restricted school tax increases and school spending increases to 4%. At the same time, state funding has increased 10%. However, of that 10% increase, 2.89% (same as the inflation rate) goes to school spending and the remaining 7.11% goes to property tax relief. It works as follows: Let’s say you pay $100 in school taxes. The district can (and will) raise your taxes to $104. However, the state has provided $2 in property tax relief. So, your final tax bill is only $102. The school board, therefore, claims they’re only raising taxes 2% and discounting the fact they’ve taken your tax relief money as well. Meanwhile, the board gets to congratulate themselves for “fiscal restraint” when all they’ve done is held spending to the legal limit. I’m sure we’ll be hearing more about the school board taking a “zero-based cost approach”, that the highest taxed school district in the county had no choice but to raise spending and taxes to the legal limit, and that rejecting the budget will put our children “at risk”. After the citizenry rejects the school board’s spending plans for the 7th consecutive year, the district will once again circumvent the voters’ wishes and negotiate spending proposals with the municipalities. It’s too late to run any reform candidates this year but mark my words – 2009 is the year we begin throwing the bums out. >>> Read more! My dear readers, I know how much you like to read about Matawan and Aberdeen but I hope you’ll forgive me if I digress a bit, today. You see, this story takes place in a far away land called Manalapan. A long time ago, in the year 2000, Mayor Stuart Moskovitz of Manalapan complained that the township attorney, a man named Norman Kauff, was charging too much money. Yes, he accused our precious Norman Kauff who served so many years as Aberdeen Township’s attorney. Anyways, the mayor complained and kvetched and carped until Kauff stopped coming to town meetings at all. But this just made Mayor Moskovitz even angrier. After all, Norman Kauff was still getting paid, both salary and pension contributions, even though he was no longer coming to town meetings. But Mr. Kauff didn’t see any problem at all. In fact, only two years later, Hazlet had agreed to hire Mr. Kauff as their township attorney even though he wouldn’t be attending their town meetings either. No, he would send a subordinate to attend those long and boring public forums. Well, Mayor Moskovitz kept complaining until Norman Kauff quit. That same year, Moskovitz lost reelection but a few years later, in 2005, he was appointed the township’s attorney. That appointment only lasted one year. But I jump ahead of myself. After Kauff quit, he got a job for his good friend, Daniel McCarthy, as an attorney on the township planning board and as special counsel. Yes, this is the same Daniel McCarthy who replaced Kauff as Aberdeen Township’s attorney. Daniel McCarthy, with some encouragement from Kauff, began agitating for Moskovitz’s dismissal. As township attorney, Moscowitz had overseen Manalapan’s purchase of two homes in front of the Manalapan Recreation Center. At the time of the transaction, there was no problem and New Jersey’s Green Acre’s program contributed $250,000 to the purchase. However, the township engineer, Greg Valesi, now claimed the site required an environmental cleanup that his company would be happy to perform; the homes had an underground storage tank and some pesticides were found on the grass. Mr. Valesi works for a small company called CME Associates. Yes, the same CME Associates that serves as Aberdeen’s engineers. Original cost estimates for the cleanup were $18,000 but they’ve now risen to $110,000. McCarthy then convinced the township to sue Moskovitz for damages. I don’t know about the next part of the story but Moskovitz claims that the new township attorney, Caroline Casagrande, and the new mayor, Andrew Lucas, were reluctant to pursue the case but Kauff promised them party support for higher office. I don’t know how Kauff, a strongman in the Monmouth Democratic Party, could help two republicans but Casagrande and Lucas did gain their party’s nominations. Casagrande won election for State Assemblywoman of the 12th district. Lucas, at age 29, became one of the youngest people to ever receive the republican nomination for Freeholder in Monmouth County. He was also the first republican in over 20 years to lose the election. Shortly after her victory, Casagrande founded a new law firm, Menna, Supko & Casagrande. Yes, that’s the same Pasquale Menna who’s the borough attorney for Matawan. Pasquale Menna was formerly of the law firm Kauff & Menna, as in Norman Kauff. Well, to get back to the story, Manalapan decided to sue their former mayor and township attorney and hired Casagrande (Menna’s new partner) and McCarthy at about $130 per hour. Around this time, an anonymous blogger calling himself “daTruthSquad” suddenly appeared. daTruthSquad was both highly knowledgeable and highly critical of the town’s lawsuit. Casagrande and McCarthy insisted Moskovitz must be the anonymous blogger but he denied it. So, they did what any fine attorney billing the taxpayer an hourly rate would do – they subpoenaed Google, demanding the Internet behemoth unmask the blogger. The Electronic Frontier Foundation leapt to daTruthSquad’s defense and the presiding judge quashed the subpoena. And the case continues for around $130 per hour per attorney plus expenses, all for the good of Manalapan. Or is it for the benefit of you-know-who? Now, my dear reader, it’s time for bed. But you best remember to be on good behavior or I’ll be calling Norman Kauff. True or False: Blacks in our neighborhood, on average, are dumber than whites. The question is undoubtedly offensive but the responses I’ve gotten are far more abhorrent. Based upon conversations I’ve had with residents of the community and people connected to the school district, I feel confident saying that most people in our neighborhood, at every level, believe we should have lower expectations for our black students. Sure, they’ll couch their inclinations in politically correct terms – “Diverse Community”, “Economically Disadvantaged”, “Working Poor”, etc. – yet, they’re always referring to the African American community in Cliffwood. Buttressed by low test scores, these people view themselves as realists or “Progressives”. I view those same test scores and see nothing but self-fulfilled prophecies. First, a note a caution: The facts I’m presenting are from 2006 and do not reflect the school’s noticeable improvement this past year in all areas excluding SAT scores. Still, I believe the following information is relevant if not quite timely. In 2006, following guidelines under “No Child Left Behind”, the Matawan-Aberdeen Regional School District exceeded the state average in the percentage of students making Adequate Yearly Progress (AYP). The one group whose progress was conspicuously below the state average was Black. Black students didn’t make AYP in HSPA Grade 11 – Math, GEPA Grade 8 – Math, NJASK4 – Language Arts Literacy, NJASK4 – Math, and NJASK3 – Language Arts Literacy. Among Elementary schools, Cliffwood has the lowest scores in Reading, Language, and Math. A disproportionate number of students receiving Individualized Education Programs (IEPs) are African American. The discrepancy is greatest in Math. In New Jersey’s Grade Eight Proficiency Assessment for Math, among 52 African American students, zero achieved advanced proficiency compared to 23.4% of white students. As a category, black students also have lower test scores than the “Economically Disadvantaged” in virtually every assessment exam above 3rd grade. Every reason I’ve heard (and I’ve heard quite a few) can be characterized as follows: Blacks are “Different”. There’s the biological difference promoted in “The Bell Curve” by Hernstein and Murray. There’s the cultural difference promulgated by the late Dr. Ogbu, an anthropology professor at Berkeley who theorized that Blacks view education as “White”. There’s the oft-cited correlation between the number of books at home and test scores. Poor black families can’t afford the same resources. Black children are more likely to come from “broken” families. The tests have an inherent cultural bias. Etc. and so on. When taken together, these arguments are supposed to somehow explain why, out of 52 black students in 8th grade, not one was advanced proficient in math. If people believe that African American students in our community are dumber than whites, they should have the courage to say so. Otherwise, they need to admit we are failing our black students. I recognize that, first and foremost, parents are responsible for educating their children. However, when parents neglect their responsibilities, it then becomes the community’s obligation to teach that student. I believe our children are suffering from the “soft bigotry of lowered expectations”. Rather than constantly pulling black children out of the classroom for “special education” and reinforcing a negative stereotype, I would prefer to see more at-home tutoring. Our community has an army of semi-retired and other able-bodied folk looking for meaningful work. Rather than have them working at the local ShopRite, why not train a contingent of tutors to provide at-home tutoring. 100 tutors providing 10 hours of tutoring a week at $20 an hour would cost $700,000 – about the same as the district’s Response to Intervention (RTI) program and far less than we spend on Individualized Education Programs (IEPs). When it comes to success, we would all do well to heed Sam Walton, founder of Walmart – “High expectations are the key to everything.” All our students can do far better but especially our African American students. We need to expect more and work for it.